Esquire Bank is the "Bank of PAJ"
In May 2011, Esquire Bank announced the execution of an agreement with the Pennsylvania Association for Justice (PAJ) that names Esquire Bank as the "Bank of PAJ." Click here to the read the Press Release. In support of its commitment, PAJ has begun the process of moving its business banking to Esquire Bank. Members are given special treatment and will be assigned a personal private banker. Members have access to the Esquire Card Program (see below) at pricing exclusive to PAJ members. You will also have access to co-branding marketing opportunities. Read about the decline of the paper check in Esquire Bank's editorial in October's PA Justice News. 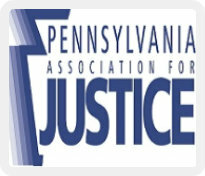 Advocating for the integrity of a robust civil justice system in Pennsylvania. The aim of these activities is to help trial attorneys better represent their wronged clients. The Association has resisted measures that, in other states, have closed courthouse doors to those who rely on courtrooms as the last resort to obtain justice. The Association also fosters public awareness of the role of the trial attorney in the administration of justice and to protect every citizen's 7th Amendment right to trial by jury.